Larry M. Robbins. 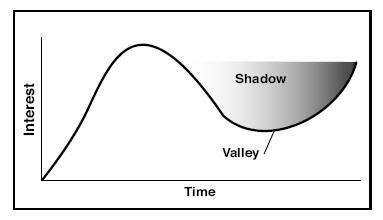 Through the Shadow of the Valley: How to Retain Attention in the Classroom. Almanac (University of Pennsylvania), vol. 50. Dec 9, 2003. Here are some strategies to prevent students from zoning out and to increase student interest. A syllogism: Human attention tends to wander; students are human; therefore, students' attention will wander. It’s a fact, both you – yes, even you! – and your students zone out in class from time to time. Most teachers are well aware when student attention wanders. One of the primary causes of wandering attention and even boredom is density of material – too many topics, too many complex PowerPoint slides and too many examples result in information overload. Students then disengage and, even after they finish the crossword puzzle, they don't tune back in. For teachers and students, poor preparation, or even the time of day, can contribute to wandering attention. Most teachers whose classes begin after lunch cannot help but notice the number of glazed eyes or count the heads nodding off. Early classes can have the same affect on students. Research on cognition and retention has shown that any class period or "learning episode" has periods of "prime-time" and "down-time" (Sousa, David A. How the Brain Learns: A Classroom Teacher's Guide. National Association of Secondary School Principals, Reston, VA, 1995; Bligh, Donald. What's the Use of Lectures? San Francisco: Jossey-Bass, 2000). Prime-time, when students are at their sharpest (usually the first ten to fifteen minutes of a class), is appropriate for introducing new information or coming to closure on old material. According to Sousa, "practice is appropriate for the down-time segment"—the valley that occurs after the introduction of new material. Practice can include analytical or evaluative questions such as: "How do the medical malpractice laws affect health care?" or "Will the Governor's new proposals improve health care?" Practice can also mean simulations, case analyses, class presentations, etc. Questions and answers are also good for the "down-time" segment of a class because they enable students to demonstrate their knowledge and their ability to apply knowledge to a new situation. Another way of engaging students is to facilitate a discussion that enables all students to participate. Discussion on a general topic will call on students to demonstrate knowledge, while enabling them to achieve a sense of "personal discovery." A danger of discussions, however, is that they often become lectures in disguise if teachers dominate by implying their own bias or giving too much information. Discussions can also take the form of a debate. When students prepare to debate, they sharpen their own critical abilities and stimulate critical response from those who are only observers. Change your voice – emphasize verbs when you want to emphasize action; emphasize nouns when you want to emphasize the result of an action. Give a concrete example that draws students back into the material and that everyone can understand. Provide internal summaries. When you distill a discussion—"so we have covered the three main methods of controlling stage fright: preparation, eye contact, breathing"—students will pay closer attention, often writing down the summary. Dr. Larry M. Robbins is the Director of the SAS Center for Teaching and Learning at the University of Pennsylvania. See www.upenn.edu/almanac/teach/teachall.html for additional essays like this one!